This model of an arch from the Moorish palace the Alhambra at Granada was probably made by the Granada model-maker Don Raphael Contreras. Such models were frequently sold to tourists, many of them British, during the 19th century. On one level they were high-class souvenirs, but on another level they were well-made miniature versions of a celebrated monument that was widely admired all over Europe. The Alhambra Palace in Granada was built during the Nasrid dynasty (1232-1492), the last period of Moorish (or Muslim) rule in Spain. Granada was the last surviving bastion of Islam in Spain until captured by Ferdinand and Isabella in 1492. The Spanish did not demolish the Alhambra, but protected and enriched it. In the 16th century Emperor Charles V built his own palace within the site. Plaster reproductions were made in great numbers during the 19th century. Plaster was a fairly cheap material and could be cast in moulds, so that copies could easily be made of the original sculpture or architectural detail, and further identical reproductions could be made to be sold more widely. Often, as here, the plaster model would then be embellished with colour or finer detailing. 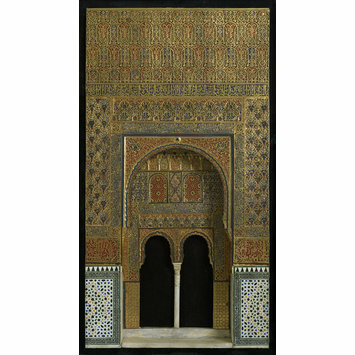 Architectural model of an arch from the Moorish palace the Alhambra at Granada , a large lateral arch in the hall of the Comares. Coloured stucco, framed and glazed. Probably made by the firm of Don Raphael Contreras in Granada, Spain. 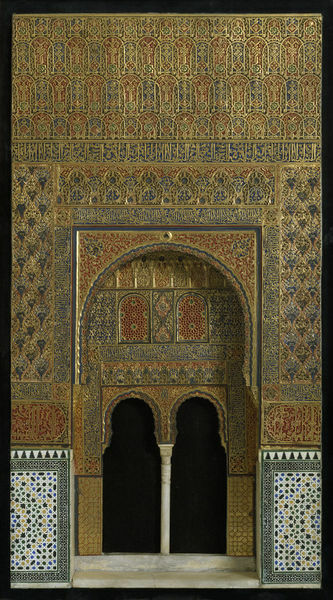 The delicate Islamic decoration of the fourteenth century Moorish palace of the Alhambra in Spain inspired the Alhambresque style of the nineteenth century, especially associated with Owen Jones (case 41). This is a model of one of the large side arches in the Hall of Comares. Rosser-Owen, Mariam, Islamic Arts from Spain, London: 2010, pp. 117-9.